Stainless steel control valves from Pneumadyne are perfect for basic on/off functions in pneumatic systems. 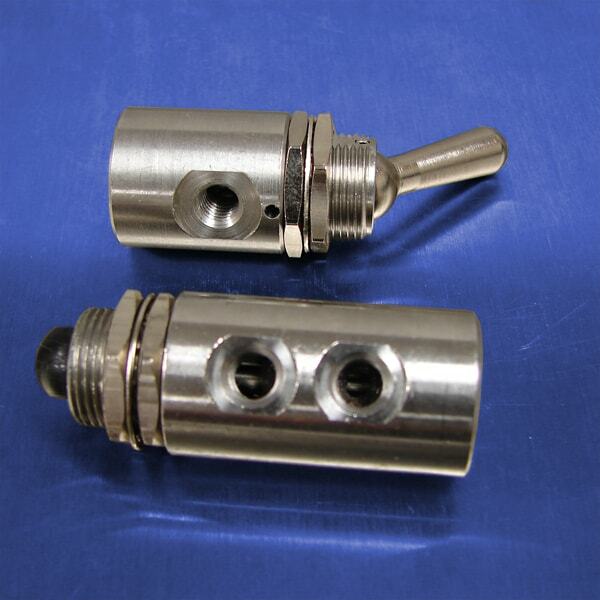 These compact pneumatic control valves are precision machined from durable 303 stainless steel and feature 10-32 (F) exhaust ports for capture and removal of exhaust flow in liquid, cleanroom, or lubricated air applications. Fully ported designs provide plumbing versatility. We offer 2-way normally closed control valves and 3-way normally closed control valves, with a variety of styles, sizes, and actuator options to choose from. Our stainless steel pneumatic control valves can accommodate flow rates from 15.5 scfm to 20 scfm at 125 psi (varies by model); select models are suitable for vacuum up to 26” Hg at 125 psi. See individual product listings for additional information and specifications. If you need compact, high quality stainless steel pneumatic control valves, you need Pneumadyne. Request a quote or contact us for control valves for your pneumatic system.